This entry was posted on Friday, 26 December 2008 at 12:47 am and is filed under Holidays. Well at least I got your text message way ahead of the others. Hope you had wonderful Christmas in your new home. nice pic … how was your christmas celeb? looking forward to the new year countdown? I like this place…The name reminds of the tongue stinging that tiny hot pepper gives me. Back home, we call it “kutitot nga katumbal”. 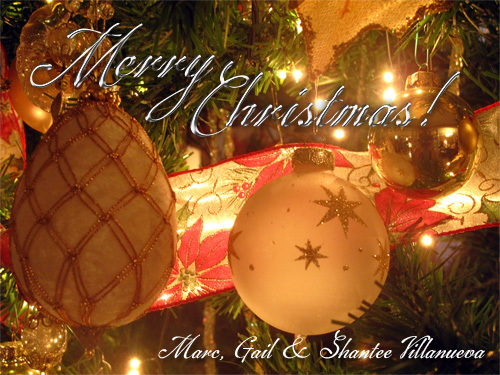 To Marc, Gail & Shatee, I wish you blessed New Year for 2009. I’ll visit this place from time to time.